"For sixty-nine years, the Order of DeMolay has prepared young men to become better citizens and leaders for our country. My DeMolay experience gave me the confidence to develop my skills as a speaker, team member, and leader, and then to realize and accomplish my dreams. I will always be thankful for the guidance given to me by my friends in DeMolay. " Clinton was initiated into Hot Springs Chapter DeMolay in Hot Springs, Arkansas, in 1961, where he served as Master Councilor. He received the Chevalier in 1964, and the Legion of Honor in 1979. 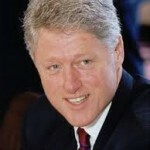 Clinton was inducted into the DeMolay Hall of Fame on May 1, 1988.